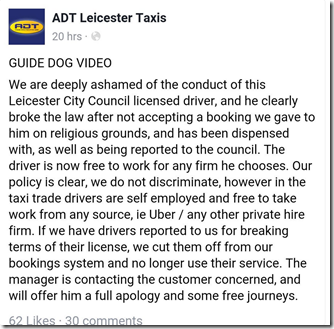 In a recent video posted on Facebook, a taxi driver for ADT in Leicester appears to refuse service to a guide dog owner citing his religion as the reason. The driver then pulls away, leaving the disabled man stranded when he protests at being told he will have to wait for another car. This, sadly, is not an uncommon experience. It was also reported in the Lancashire Evening Post recently that ‘almost half’ of guide dog owners are refused service by taxi drivers. As mentioned by the man in the video, this contravenes the equality act and a driver called Zabar Hussain was the first man in the Lancashire area to be fined for refusing a guide dog owner as a result. In September 2015, Colin Bradford was leaving Milton Keynes Hospital with his son when a cab driver declined to take the booking because he was also accompanied by his guide dog. Five further drivers from the same firm subsequently refused the booking via an electronic booking system and one driver drove off when he saw the guide dog at the pick-up point. This appears to be a uniquely Muslim issue, rather than simply a ‘religious’ one. There is a widespread belief within the Muslim world that dogs are ‘impure’ and therefore they are rarely part of a Muslim household. It is also illegal to own a dog in Iran where doing so could earn you a hefty fine and 74 lashes. When I spoke to Muslim reformer Asra Nomani she told me three of the four schools of Islamic jurisprudence say that Muslims cannot have dogs as pets. “Anyone who is a dog lover knows how wrong that is” says Nomani. “It’s just so unbelievably cruel to the beauty of dogs as pets”. “Children all across America, Muslim families have this difficult conversation with their parents begging them to get the puppy that every kid wants and being told “oh no, we’re not allowed to in Islam”. In an act of ant-theocratic defiance, which Asra terms ‘My Muslim reform’, she decided to become a dog owner in her adulthood so that her young son would not miss out on such a rewarding experience. I’m surprised these reports of discrimination against the disabled have been mostly confined to local newspapers. In this current post-Brexit climate, the mainstream media are quick to jump on the merest whiff of anti-Muslim sentiment. It would seem prejudice at the hands of Muslims doesn’t generate quite the same appetite however. It may be worth asking the taxi company in question what assurances they can provide going forward, and whether they will be dispensing with any drivers that are unfit to do their jobs. In terms of appropriate responses, I don’t think you can fault the clarity and action taken by the company here. If I’m ever in need of a taxi in the Leicester area, I’ll be sure to give them my custom. Hats off for the uncompromising response. What disgusting, immoral and illegal behaviour on the part of that taxi driver and the dispatcher who allowed the driver to abandon the blind man (and his dog) on the side of the road. How appalling for that would-be passenger to be stranded and have to wait for a non-bigoted driver to pick up the fare. And how disgraceful that the dispatcher agreed to allow that to happen. Thanks for including a link to the company, Stephen. Although I’m an ex-pat Brit (now living in Australia) I’m so outraged at what’s happening in the land of my birth that I felt a strong need to express that anger to the people who most need to hear it. I emailed them and left them in no doubt about my feelings. It’s time those drivers who refuse to accept a fare when a ‘helper dog’ is involved weren’t just warned, or fined. They should be stripped of their taxi licence . 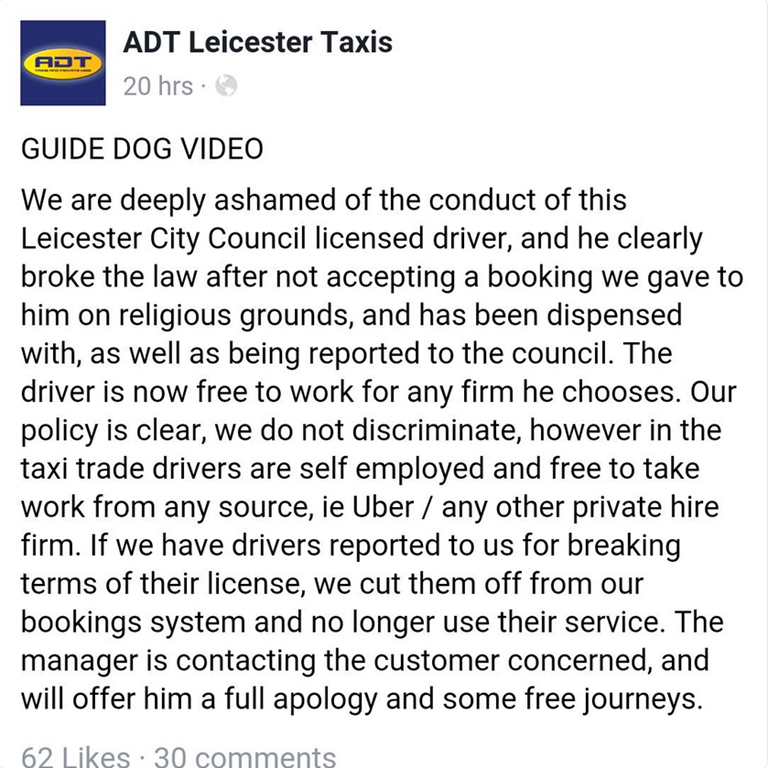 As should any taxi company that employs drivers who refuse fares when a ‘seeing eye’ dog is involved. I think a bit unfair to regard as mean minded discrimination although that is the effect, more a cultural negative reaction against dogs in the same way as those Christians recently who refused to let a gay couple share a room in a B & B. It is however illegal as all services must be provided to all so those people who wish to be selective of their customers are not suitable to do those jobs and presumably they must comply with licensing requirements. 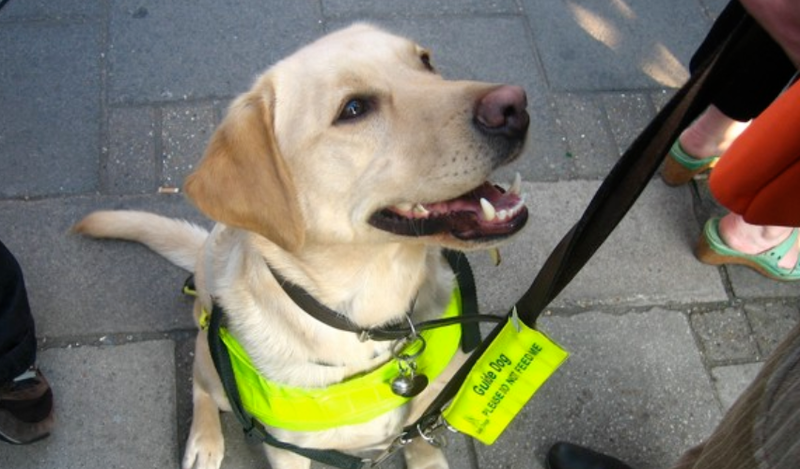 Refusing to carry dogs in a taxi is bad enough but to leave blind people stranded really takes the biscuit. I recall a taxi driver (black cab) chatting away complaining about the expense of the obligatory fitting of a ramp to the cab so as to allow a wheel chair access. He was emphatic that he’d never stop for someone in a wheelchair do to the risk of an insurance claim and the time it took to get the passenger on and off. HarryR – Neither culture nor religion should be regarded as ‘get out of jail free’ cards when it comes to ‘mean-minded discrimination’. Nor does comparison with homophobes in any way let the dogophobe off the hook. If you’re discriminating against someone on the basis of the animal companion they need to lead a full life (whether blind or, in the case of an acquaintance, because of a PTSD-related debilitating mental state), the fact remains that the person refusing to carry the owner and their dog is ignorant and/or compassionless (and a law-breaker). Yes, services offered to the public should be offered without discrimination. I agree. My comment was too vague. fairlycirrus – I was seeking to contract the motivation of someone accustomed to a personal or cultural ( not necessarily meaning religious) exclusion of dogs or animals in general to an entirely mean-spirited cherry picking filtering of customers illustrated by my own anecdote. I’ll add another, but from the other perspective – when I lived and worked in Leeds many years ago a taxi driver told me that drivers were in conflict with the local council as the drivers were reluctant to takes fares to one particular pert of town as once there and dropping the fare off they were too often subject to attack, robbery, physical assault and damage to their vehicle. The council insisted they couldn’t refuse to go to a specific part of town, the drivers were refusing. I don’t know how this was eventually resolved. In the same town when buying clothing for a my first adult skiing trip I couldn’t buy a ski mask as they were banned due to their popularity with local robbers. Gets even worse when you consider that in quite a few places in the UK now, all the taxi companies are run and staffed entirely by Muslims, leaving guide dog owners entirely at the mercy of these people. The “dog disgust” should be in the same bin as “don’t wear clothing of mixed fibres” (in Leviticus or one of those books). I doubt that now, any vicar would have to tell their congregation that they can actually wear clothes with mixed fibres, whatever the bible says. This is where the Islamic religion can help – or not. Should imams in mosques tell people that dogs are great pets, rather than going by some obscure hadiths where they are banned? I get the feeling they won’t do that. Can they even go as far as telling their congregations, that if you are a taxi driver, you have to *HELP THE BLIND* by taking a dog? I get the feeling they won’t do that. What happened to “mercy”? 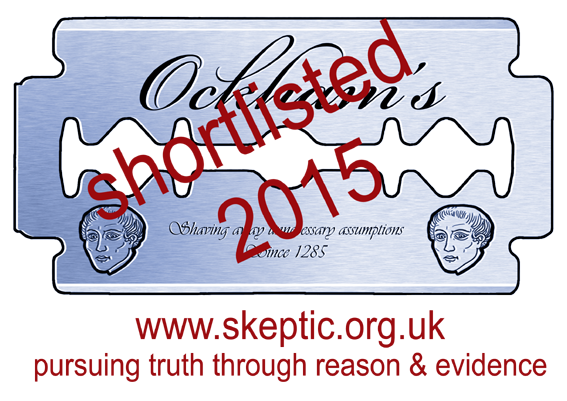 It’s the same with “offence” whether it be cartoons, films, books, TV documentaries, etc. All we get is “But there should not have been any violence, BUT what you need to understand is (our religion and all its forbidden stuff)”. I am very tired of this now. There are differing lists of precisely what is considered impure/najasat. Some include us infidels, right there betwen alcohol and vomit (good times!). Perhaps worth bearing in mind should either your carry out or corgie be refused entry to a taxi. If it is a religious situation why don’t they just have “pet” as part of the uber pickup so this can be avoided in the future. It just makes sense and is an easy solution. “Thank you for your email, we deeply ashamed of the conduct of this Leicester City Council licensed driver, and he clearly broke the law, and has been dispensed with, as well as being reported to the council. The driver is now free to work for any firm he chooses. Our policy is clear, we do not discriminate, however in the taxi trade drivers are self employed and free to take work from any source, ie Uber / any other private hire firm. If we have drivers reported to us for breaking terms of their license, we cut them off from our bookings system and no longer use their service. The manager I believe is contacting the customer concerned, and will offer him a full apology and some free journeys. Very pleased to have received that response. I guess that driver could well be out there on the roads, continuing his refusal to accept fares from dog-assisted blind people. But at least that incident has been noted and it might help to make this behaviour less acceptable. I understand religion and maybe it makes them feel sinful or forced into something illegal. Beliefs and ways of your family are hard to unlearn. Maybe there should be a disclosure for certain taxi companies that some drivers may not accept for religious reasons. Or another can company might advertise TO be accepting of service animals. Problem solve and be the better company and then the driver knows when they apply! I don’t think it’s a good idea to be making concessions for personal religious dogmas – as where does that end? Can they refuse service to homosexuals? Women? A case could be made for both with reference to religious conviction. You either do the job you’re paid to do or look elsewhere for another. That’s a much more sensible (and fairer) approach to these issues.